I feel like I begin every post recently with an apology. Mostly for lateness. And I was ready to apologize this time as well, because really, calling this recipe seasonal would be pushing it. Panzanella is ideally midsummer food. It’s perfect with those beautifully gnarly heirloom tomatoes, and is the kind of thing you devour for an alfresco lunch in July. But (and I make this confession knowing that some of you may only hate me as a result), the weather where I live is still kind of perfect. It’s California after all. That infuriating place where late September still means ripe tomatoes at the farmers markets, where the temperatures are still in the glorious high 70s, and where we can pretend that summer is not in fact, over. Join me in this place of denial for a moment. Because then you can make this panzanella pronto, before the produce you need for it is truly and totally out of season. Save the mealy hothouse tomatoes for another recipe. This one deserves your pretty girls. 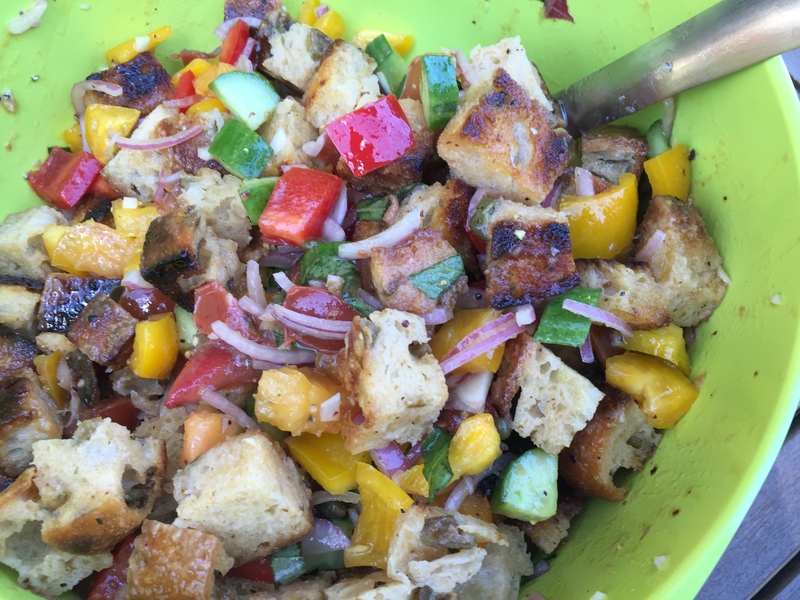 If you’re a panzanella newbie, this recipe is a treat. Essentially an Italian bread salad accented with fresh vegetables, it’s a feast for the eyes and the tastebuds. For those of you that have made panzanella before, the game changer here is toasting the bread cubes before tossing the salad. It allows it to get soft and juicy without venturing into the dreaded territory of soggy. The dressing is light and bright. All in all, it’s perfect early fall late, late, late summer food. Heat the oil in a large sauté pan. Add the bread and salt; cook over low to medium heat, tossing frequently, for 10 minutes, or until nicely browned. Add more oil as needed. For the vinaigrette, whisk together the ingredients. In a large bowl, mix the tomatoes, cucumber, red pepper, yellow pepper, red onion, basil, and capers. Add the bread cubes and toss with the vinaigrette. Season liberally with salt and pepper. Serve, or allow the salad to sit for about half an hour for the flavors to blend. How’s that for a dramatic title? I know it seems like I was just looking for attention, but these claims I make are true. This is, without a doubt, the best tomato sauce ever. It is also the easiest, to the point where it seems almost too good to be true. It has fewer ingredients, requires less babysitting, and tastes incredible. The secret? Butter. A bit more butter than you’d probably think a tomato sauce would need. But the result is an amazingly full, rounded flavor, way more complex than the ingredients let on. Butter does that, you know. There’s a reason I titled my blog the way I did. This recipe comes from the late, great Marcella Hazan, the first lady of Italian food for home cooks everywhere. She’s all about reducing a dish to its essentials, not messing with the good stuff, and this recipe is one of her best (which is saying a lot). Of course, I had to mess with it a little bit. The original calls for tomatoes, onion, and butter. Period. I added some spice, because I just couldn’t help it. She also has you discard (gasp!) the onion once the sauce is ready – I guess in her book, they’ve done their job infusing the tomatoes. This seemed egregious and wasteful to me, so I ground it up and added it back in. I would like to believe this improves things. And, while I’m confessing to veering from the purist Italian tradition, here’s one more. When I’m feeling a little less indulgent than usual, I HAVE actually made this dish with a tablespoon or two less butter than called for. I pretend it doesn’t make a difference, even though my taste buds would disagree. 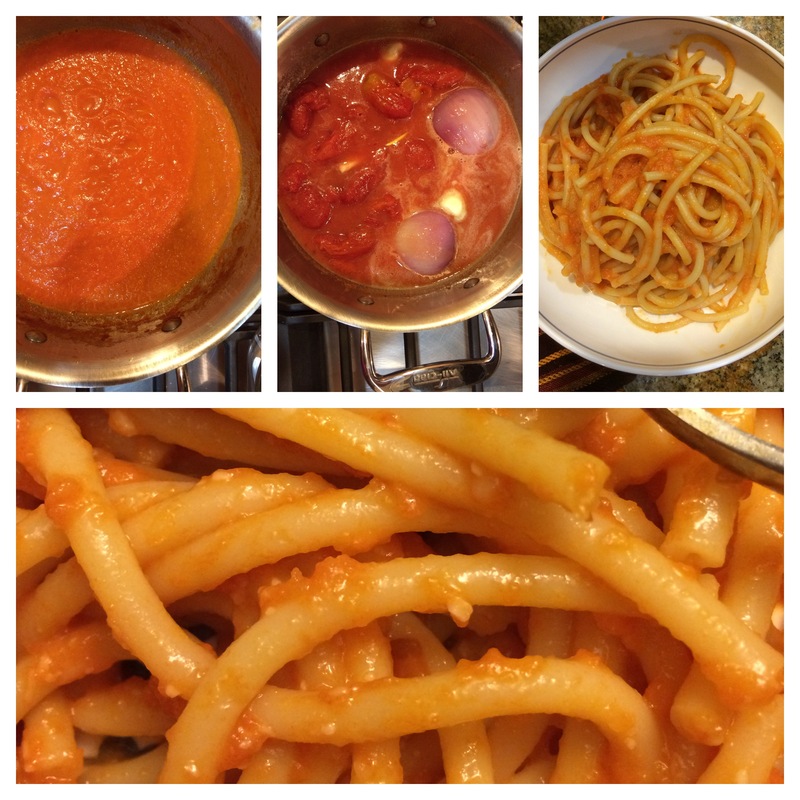 Lastly, this sauce could work for a variety of pastas, but spaghetti or other long thin shapes are ideal. Most recently, I made it with bucatini (which is like a hollow spaghetti). and this may be my new favorite pairing. Combine the tomatoes, onion, garlic, butter and red chili flakes in a heavy-bottomed saucepan. Place over medium heat and bring to a simmer. Cook, uncovered, for about 45 minutes. Stir occasionally, mashing any large tomato pieces with the back of a wooden spoon as you go. Add salt to taste. Carefully remove the onion and garlic cloves and give them a whir in the food processor (this part is optional and for the onion lovers only). Add back to the sauce. Combine the sauce with the pasta. Serve, taste, and swoon. Cheese optional – my husband likes a little parmesan on top, I don’t think the sauce needs it. So anyway, cauliflower risotto. It seemed like one of the few things I hadn’t tried with cauliflower. I was in the kitchen eyeing a massive head of cauliflower. I really wanted to make one of my standby weeknight dinners (pasta with cauliflower and breadcrumbs), but the husband has grumbled about it being “too dry” the last few times. I have no idea what he’s talking about, but I had some time to spare for a change, so was in the mood to be amiable. I nosed around and found a bag of arborio rice that hasn’t received much love from me lately. I mean, I love risotto (really truly do), but show me a new mom who has time to stand by the stove stirring rice for 30 minutes, and I’ll show you…well, something else equally unlikely. Now, I know this recipe does not photograph well. It’s pretty much the opposite. I wouldn’t blame you if you found the picture downright unappetizing. A lot of this can be attributed to my poor iPhone picture skills, but really, appearances are deceptive. Do as I did and soldier on, and you will be rewarded with a truly delicious plate of food. Perfect for an early winter night. I threw in some capers (because everything is better with their briny saltiness) and sliced almonds for crunch. I think a crunchy breadcrumb topping would have been the bomb, but didn’t have the time to experiment with this. You should. To get yourself ready, toast the sliced almonds until light golden and set aside. Also set the stock over medium heat and bring it to a steady simmer. Heat the oil in a pan over medium heat and add the chili flakes and chopped onion. Saute for a few minutes until onion is translucent. Add the rice, stirring for a minute so it gets nicely coated in oil. Add the cauliflower florets, stir, and then add the thyme. Season with salt and pepper. Add the wine and cook until it mostly evaporates, about 2 minutes, then begin ladling in the stock about 1/2 cup at a time. Stir frequently, adding more stock as it absorbs into the rice and vegetables. Break down your softened cauliflower florets as you go, if you’d like them to melt further into the risotto. After about 18-20 minutes, the rice should be mostly cooked, with a pleasing chewy bite. You may not have used all the stock. Add one last ladleful of stock, stir well, then add the capers, almonds, cream and parmesan. Taste and add salt and pepper as needed. Eat hot. Leftovers fry up into excellent cakes (with a little egg-flour-breadcrumb topping).